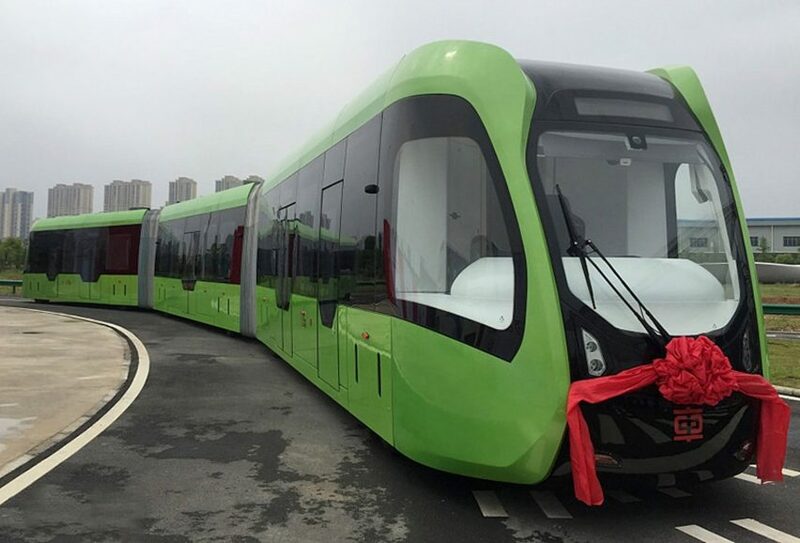 A self-driving vehicle that is like a train, but which doesn’t run on tracks, has made its first journey in Chinese city Zhuzhou. The new form of public transport has been developed by Chinese transport manufacturer CRRC. 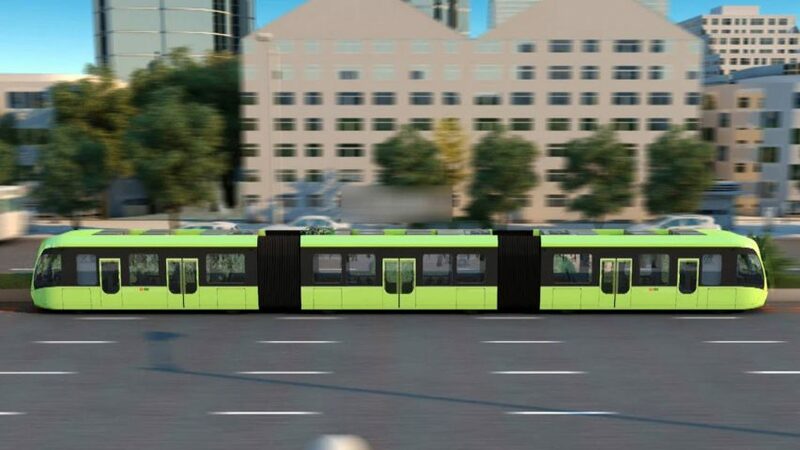 Identified as a cross between a bus, train, and tram, the so-called rail bus follows markings painted on the road, instead of conventional rail tracks. The design was unveiled in June this year. Less than five months later, on 30 October 2017, CRRC began tests of the rail bus. 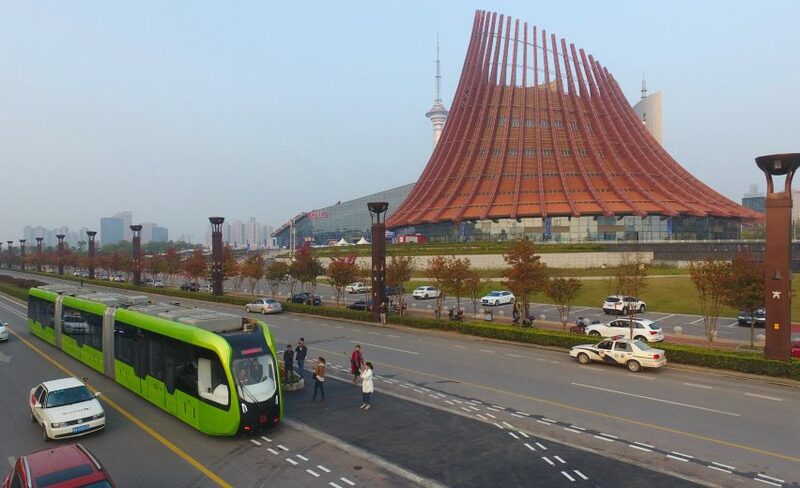 It travelled along a 3.1-kilometre route, stopping at four stations in Zhuzhou. The journey has been hailed a world first by local media. The system works by scanning the painted road markings, using sensors on the underside of the vehicle. These sensors are able to detect pavement and road dimensions by the millimetre, and send travel information to the train whilst in transit. For safety reasons, a driver was present on the test run – but CRRC envisages the service becoming totally autonomous in the future. It is expected to hugely reduce traffic congestion on Zhuzhou’s roads. The electric vehicle is billed as being a cheaper and more eco-friendly alternative to current transportation systems in China. Ten minutes of charge can power the electric vehicle for 25 kilometres (15.5 miles). It can reach speeds of up to 43 miles per hour (69 kilometres per hour) and is said to have a life-span of around 25 years. The system is also significantly cheaper to install than a subway system – which in China typically costs between £45 and £80 million. CRRC estimates the construction and implementation of a rail-bus network at about 20 per cent of this. Zhuzhou’s rail-bus network is set to become operational in early 2018. Each vehicle will be able to accommodate up to 300 passengers at a time. The rail bus isn’t the first radical transport idea to come out of China. A concept for a bus that straddles traffic was released in 2016 – but was scrapped in May 2017, after growing speculation that it was just an investment scam. Other radical new ideas for public transportation include a self-driving public bus, which made its first test journey in a rural town in Bavaria earlier this year.